Due to its strategic geographical location on the U.S.-Mexico border, Texas A&M International University has embraced as its mission the establishment, consolidation and growth of academic exchanges between its faculty and students and Ibero -American institutions, scholars and students. 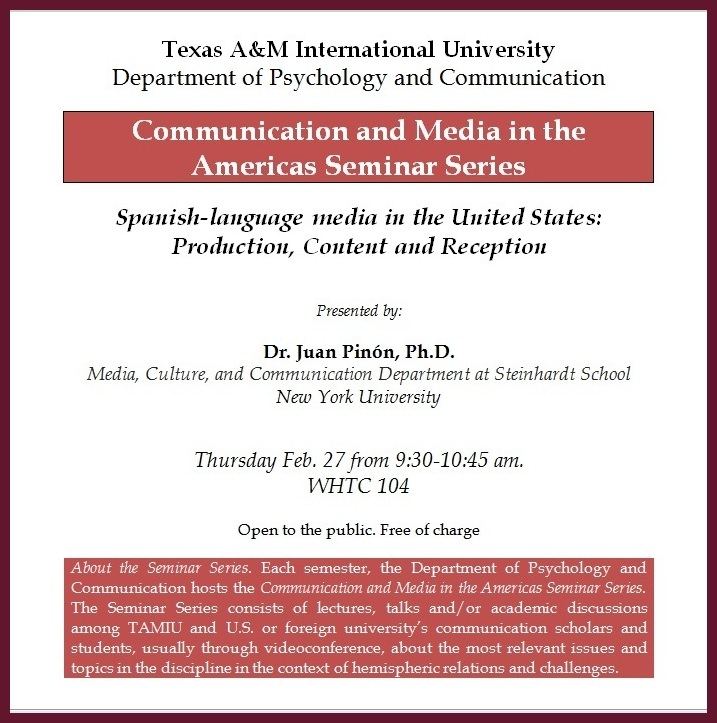 Each semester, the Department of Psychology and Communication hosts the Communication and Media in the Americas Seminar Series. The Seminar Series consists of lectures, talks and/or academic discussions among TAMIU and a Ibero-American university’s communication faculty and students, usually through videoconference, about the most relevant issues and topics in the discipline in the context of hemispheric relations and challenges. According to the topic at hand, one TAMIU communication class hosts the videoconference, but all communication faculty and students are invited to attend. March 18, 2015. Dr. Joseph D. Straubhaar, Amon G. Carter Centennial Professor of Communication in the Department of Radio-TV-Film at the University of Texas at Austin. "Telenovelas and Transnational Media Flows." CAMPUS VISIT. Feb. 26, 2015. Dr. Wilfried Raussert, Chair and Professor of North American Literary and Cultural Studies and Director of Inter-American Studies at Bielefeld University, Germany. "Fandango sin Fronteras: Music Flows and Diaspora Community Building." CAMPUS VISIT. Nov. 3, 2014. Dr. Horst Tonn, Department of American Studies, Tubingen University, Germany. "The American culture seen from Europe." CAMPUS VISIT. Oct. 30, 2014. Dr. Salvador Alvidrez, Political Communication Lab, Universidad Autonoma de Nuevo Leon (UANL), Mexico. "Schematic representations of ethnic minorities in young university students." VIDEOCONFERENCE. April 28, 2014. Luis M. Contreras, Senior Story Artist for Animation, Columbia College, Chicago. "Animated expectations." VIDEOCONFERENCE. Feb. 27, 2014. Dr. Juan Pinon, Department of Media, Culture and Communication, New York University (NYU). "Spanish-language media in the United States: production, Content, and reception." VIDEOCONFERENCE. In January 2015, the Master of Arts in Communication of TAMIU started an editorial partnership with Tecnológico de Monterrey, México, co-editing the academic journal Global Media Journal Mexico (GMJM, ISSN 2007-2031). Established in 2004, the GMJM is a peer-reviewed, electronic and open access scholarly Journal that has been continuously published semi-annually for the past ten years. Communication scholars from all Latin American countries and Spain submit on a regular basis articles for publication in this refereed international journal. The journal was transferred from Monterrey to TAMIU’s Texas Digital Library platform, and is now being published here while maintaining an editorial partnership with the Monterrey Tech, thus making this an international endeavor in line with the University’s vision. 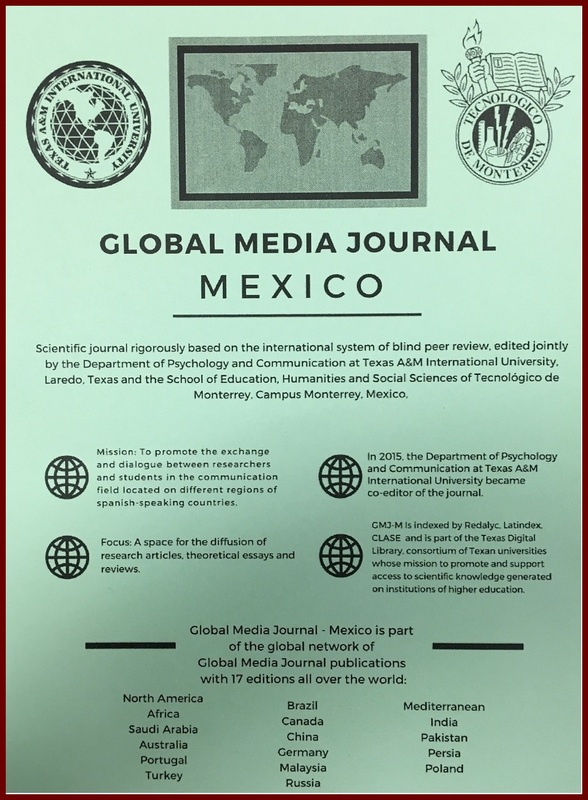 The editor of Global Media Journal Mexico in TAMIU is Dr. J. Carlos Lozano, and Rogelio Hinojosa acts as Associate Editor. Stuart Davis, Assistant Professor of Communication, is a member of the Editorial Board. The link for Global Media Journal Mexico is https://journals.tdl.org/gmjei/index.php/GMJ_EI. Belem G. López. Doctoral candidate in cognitive psychology at Texas AM University, College Station. Research stay: March 16-20, 2015. Supervisors in TAMIU: Dr. Roberto Heredia and Dr. Anna Cieslicka. Crysta Robbinson. Graduate student from the Cognition and Language Laboratory at the University at Albany, SUNY. Research stay: March 18-April 3, 2015. Supervisors in TAMIU: Dr. Roberto Heredia and Dr. Anna Cieslicka. Diana Gamboa. MS in Communication student at Universidad Iberoamericana-Santa Fe, Mexico City. Research stay: February 18-March 18, 2015. Supervisor in TAMIU: Dr. J. Carlos Lozano. Gonzalo del Moral. MS in Communication student at Universidad Iberoamericana-Santa Fe, Mexico City. Research stay: July 5-30, 2014. Supervisor in TAMIU: Dr. J. Carlos Lozano. Ana Elizabeth Maruri. MS in Communication student at Universidad Iberoamericana-Santa Fe, Mexico City. Research stay: July 5-30, 2014. Supervisor in TAMIU: Dr. J. Carlos Lozano. Patricia Gonzalez. Cognitive Laboratory. January-May 2015.Supervisors in TAMIU: Dr. Roberto Heredia and Dr. Anna Cieslicka. The Behavioral Sciences Institute is comprised of various learning centers and research labs. These centers and labs provide the university and community with opportunities for collaborative partnerships to address pressing issues within our society. The GREAT (Graduate Retention Enhancement at TAMIU) seeks to increase the number of Hispanic students who complete a graduate degree and are prepared to attain a doctoral degree or professional career in behavioral, biological and mathematical sciences. The Cognitive Sciences Lab conducts studies to determine how the brain functions in regard to bilingualism (Spanish/English). The TAMIU Community Stress Center provides local (bilingual) counseling support services in Webb County. Individuals from the community interested in receiving counseling services can call the Stress Center at: (956) 326 3120.